Conopholis americana American cancer-root Orobanchaceae COAM; Q (DeCandido 2001); R; (DeCandido 2001) possibly historic. Conopholis americana.© 2001 Eleanor Saulys.ct-botanical-society.org. (Accessed 5/2014). 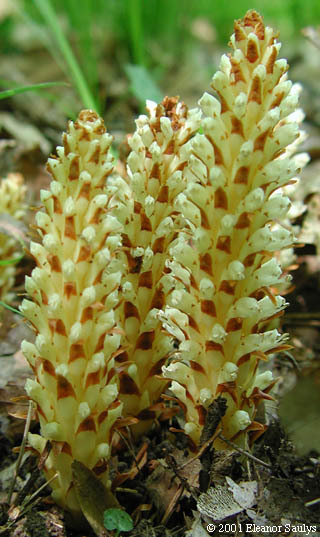 Conopholis americana is a herbaceous root parasite of some oak species. Entire plant yellowish or pale brown (no chlorophyll), 5-20 cm tall, erect, unbranched, stem stout, covered by leaf scales, often forming rounded knobs on tree roots, resembling old cones of white pine. Leaves reduced to scales, to 2 cm long, fleshy, egg-shaped. Flowers very irregular, tubular about 1 cm long, in axils of leaf scales on upper half of the plant; blooms May-June. Fruit dry, oval, tipped by persistent stigma, seeds small, numerous . Frequency in NYC: Very infrequent, possibly historic. Habitat: Rich oak woods. Often hidden under fallen leaves.